Pivoting from Coco, the new animated film Ferdinand gives another decent movie-going option for families over the Christmas holiday. A solid vocal cast helps Ferdinand entertain the masses, with John Cena a great choice to star in the movie. This is...just...fine. It is harmless and pleasing and completely easy to watch. I'm not sure the 1936 origin story envisioned wacky comedic chatty animals, Nick Jonas-inspired Oscar songs. Point being, the source material gets lost along the way. Though it retains a nice message, you've seen this movie already - and executed a whole lot better. Some feel that in a post-Coco world, the movie seems a bit regressive with cultural topics and themes. I will say this, the controversy of bullfighting has been solved apparently! 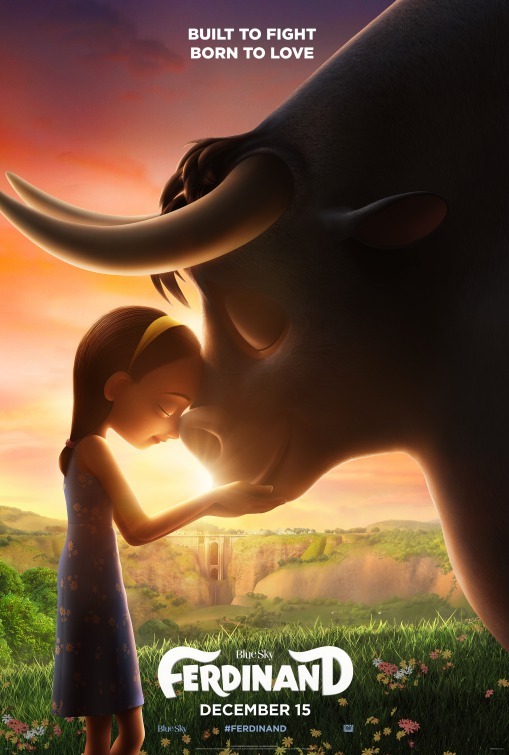 Based on Munro Leaf’s 1936 children’s book, which was previously the subject of a Walt Disney-produced Oscar-winning animated short film in 1940, Ferdinand brings us the story of a passive hero in a time when those who speak the loudest, and embody a bullying aggression, seem to capture all the headlines. Cena turns out to be a terrific choice for the role. To those familiar with him outside of WWE, he has shown some great comedic tendencies in movies like Trainwreck and Sisters, and even some impressive dramatic chops in the 2017 drama The Wall. Here, his enthusiastic, naïve, wide-eyed take on a kind-hearted bull works quite well, once he enters into the story as a grown-up version of a young bull, whose father never returns home following a bullfight. Bullied by fellow bulls as a young bovine, Ferdinand flees his home, Casa del Toro, now orphaned. He finds solace with Nina (Lily Day), a young girl who lives on a large farm. She makes him her pet, and as an adult, he encounters a number of chatty, talking animals. Nina has a dog, Paco (Jerrod Carmichael), and a trio of hedgehogs pop into frame, named Una (Gina Rodriguez), Dos (Daveen Diggs), and Cuatro (Gabriel Iglesias). A wise-cracking triad of dancing horses (Flula Borg, Sally Phillips, Boris Kodjoe) are in a nearby field, and the bulls Ferdinand grew up with resurface, led by the overbearing Valiente (Bobby Cannavale). Even as characters drift in and out, the movie bounces along harmlessly (blandly, perhaps? ), jolting to attention when Kate McKinnon’s Lupe arrives. A “calming goat”, she is bonkers crazy and McKinnon’s over-the-top antics allows Cena the chance to explore Ferdinand’s personality, playing opposite someone he can cut loose with, giving the movie some much-needed comic relief. There is nothing objectionable with Ferdinand, the movie is well-executed and helmed by veteran animation director Carlos Saldanha (several Ice Age films, Rio, Rio 2). Pleasant enough, Ferdinand struggles with lackluster writing and mundane execution, Everything here is nice, but nothing really sticks. Dismissing the film out-of-hand is not entirely fair because the film’s message of acceptance, embracing differences, and being true to who you are resonates with audiences of all ages. Ferdinand’s arrival should be lauded on some level, providing us with themes and thoughts most of us would agree are necessary and important, in an increasingly toxic public climate. There is just nothing original, fresh, or all that remarkable about how this story gets delivered. We have seen talking animals written better. We have seen barnyard comedy done better. We have felt more emotion. We have heard better dialogue. We have experienced a connection to material that is largely absent here. Ferdinand is mostly inoffensive, amusing, and fine. Everyone does what is asked of them. Saldanha can direct a movie like this in his sleep. And therein lies the problem: Ferdinand is serviceable and passable entertainment. The potential to be significant and profound exists here, but ultimately the movie just languishes and then wraps up, with a Nick Jonas Oscar-contending original song to take us home bopping our heads as a distraction from failing to recall anything we have just witnessed. Featuring the Voices of: John Cena, Kate McKinnon, Lily Day, David Tennant, Bobby Cannavale, Anthony Anderson, Peyton Manning, Tim Nordquist, Gina Rodriguez, Daveen Diggs, Gabriel Iglesias, Miguel Ángel Silvestre, Flula Borg, Boris Kodjoe, Sally Phillips, Jerrod Carmichael, Juanes, Jeremy Sisto. Written by: Robert L. Baird, Tim Federle, Brad Copeland (screenplay); Ron Burch, David Kidd, Don Rhymer (screen story). Adapted from the novel "The Story of Ferdinand" by Munro Leaf and Robert Lawson.